Devendorf, Andrew R rown, Abigail A and Jason, Leonard A 2018. Patients’ hopes for recovery from myalgic encephalomyelitis and chronic fatigue syndrome: Toward a “recovery in” framework. Chronic Illness, p. 174239531881596. Friedberg, Fred 2016. Cognitive-behavior therapy: why is it so vilified in the chronic fatigue syndrome community?. Fatigue: Biomedicine, Health & Behavior, Vol. 4, Issue. 3, p. 127. Adamowicz, Jenna L. Caikauskaite, Indre and Friedberg, Fred 2014. Defining recovery in chronic fatigue syndrome: a critical review. Quality of Life Research, Vol. 23, Issue. 9, p. 2407. Lipkin, DP, Scriven, AJ, Crake, T, Poole-Wilson, PA (1986). Six minute walking test for assessing exercise capacity in chronic heart failure. British Medical Journal (Clinical Research Edition) 292, 653. McCrone, P, Sharpe, M, Chalder, T, Knapp, M, Johnson, AL, Goldsmith, KA, White, PD (2012). 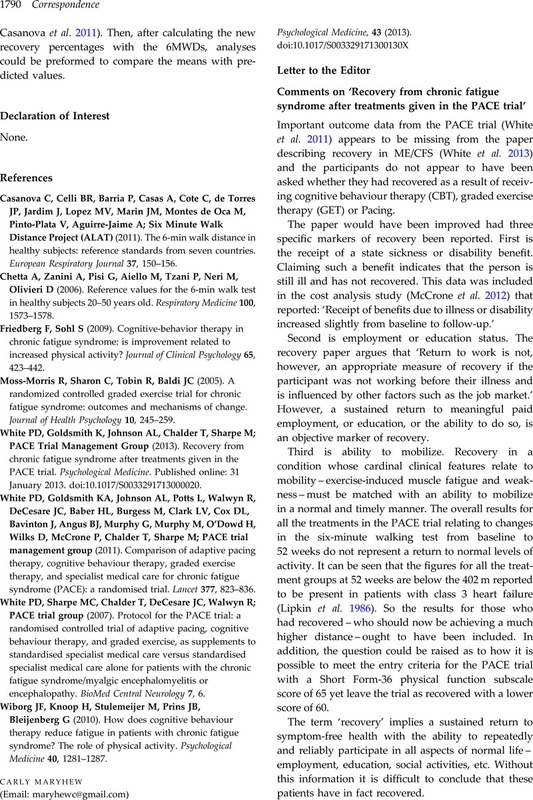 Adaptive pacing, cognitive behaviour therapy, graded exercise, and specialist medical care for chronic fatigue syndrome: a cost-effectiveness analysis. PLoS One 2012, 7, e408084. White, PD, Goldsmith, KA, Johnson, AL, Potts, L, Walwyn, R, DeCesare, JC, Baber, HL, Burgess, M, Clark, LV, Cox, DL, Bavinton, J, Angus, BJ, Murphy, G, Murphy, M, O'Dowd, H, Wilks, D, McCrone, P, Chalder, T, Sharpe, M (2011). Comparison of adaptive pacing, cognitive behaviour therapy, graded exercise therapy, and specialist medical care for chronic fatigue syndrome (PACE): a randomized controlled trial. Lancet 377, 823–836. White, PD, Goldsmith, K, Johnson, AL, Chalder, T, Sharpe, M; PACE Trial Management Group (2013). Recovery from chronic fatigue syndrome after treatments given in the PACE trial. Psychological Medicine. Published online: 31 January 2013. doi:10.1017/S0033291713000020.